Sale-A-Bration 2010 - Don't Miss It!!!!!!!!! Sale-A-Bration promotion gives reason for everyone to CELEBRATE! *Note: This benefit only available on qualifying customer and workshop orders. Online orders do not qualify. Orders qualifying for a free Sale-A-Bration product with a $50 purchase may be placed with a demonstrator, customer, workshop, or online order. Online orders do not qualify for the free hostess Sale-A-Bration item at $300. Available January 5-March 31, 2010! Click here to email me to schedule your party for SALE-A-BRATION. You can earn EXTRA FREE products. Don't miss the FUN! Part of Stampin' Up! 's commitment to providing YOU with the very best crafting tools includes the belief in what we call continuous improvement. Essentially what this means is that even if something works very well, but they see a chance to improve it, they will work to make it even better. While new punch designs will be in the new body style, existing designs will remain in the existing body style for now. Available January 5, 2010! Send me an email if you would like to see some of my projects in person or book a party for you and your friends. 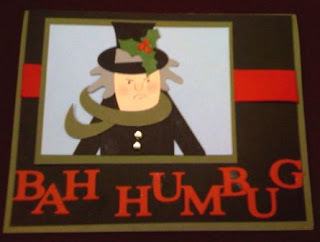 This is a card I made for my boss who is always saying Bah Humbug throughout the year. On the inside I typed Merry Christmas to the nicest Scrooge around... from all of us. 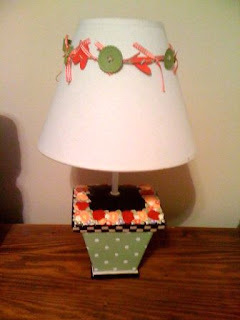 I got the idea from Carrie Gaskin who is a genius with paper piecing. I have to tell you on the glue part, less is more. The first one I tried looked like a 4 year old did the glueing. :) Merry Christmas and safe travels and remember the Reason for the Season Christ our Lord! As I collected Coke cans at work today from co-workers and they just shook their heads wondering (what is she doing now). :) I saw samples recently of snowflakes made from a coke can and just had to try it. It was quiet easy using our craft scissors to cut your can open and then flatten it out and run it through the the Big Shot using the Snowflake #2 die. So easy and so cute. 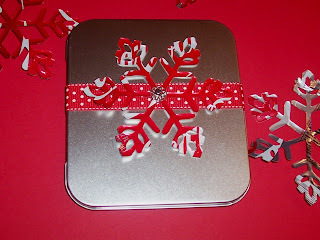 I am using it on metal tin with our polka dot ribbon and attached it with a filigree brad; of course I have a gift inside. Thanks for looking. NEW TOTE-ALLY TESS You are going to love, love, love Tote-ally Tess a new stamp set I got yesterday for my preorder.She has an apron and stamping tools and so "us" girls, you are going to have to have her. I also used the new clear mounted sets, in both the Occasions and the Sale-a-Bration (SAB) mini catalogs you will get to choose the clear mounted or our usual wooden block mounted. I am crazy about the clear mounted and did not think I would be, it takes up so much less room for storage and you can see exactly where you are going to stamp and it is quick and easy. Be sure to come to my SAB party Dec 29th. Email me to RSVP today so I can prepare for you. Remember during the SAB promotion you get free stamps and other items this year for every $50 you spend. 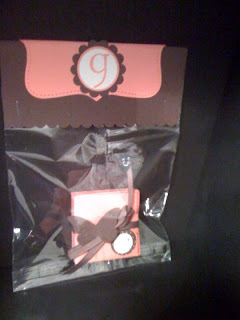 MINI ENVELOPE DIE CUT This is a mini envelope from the bitty box & envelope die from the Big Shot. I love those little envelopes and boxes. 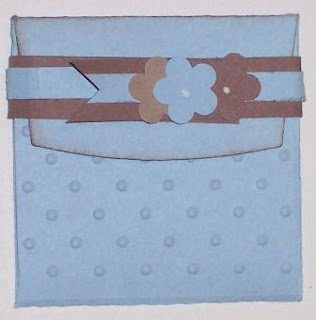 I used the new polka dot embossing folder for the front of the box and I made a little belly band with a little strip of chocolate chip and bashful blue card stock and added flowers from the trio flower punch. On the inside I punched an ornament shape and wrote a little thank you note for a good friend of mine. I hope she likes it. PAPER GARLAND This is a garland I punched buttons from our die cuts from Big Shot and heart punches and threaded twine through them and tied red gingham ribbon on the twine too. At first I had it strung across a mirror I have in the foyer and changed it to put on my lamp, makes my stamp room look festive. I am still keeping up with the 12 days of Christmas on a Yahoo Group called Late Night Stampers and this is day 7. I received a stamped card like this from one of my team members Dacia Smith and I wanted to try to make it using My Digital Studio. Thanks for looking and I hope you will stop by often to see new ideas. I recently took a challenge on Late Night Stampers to send in a project every day for the 12 days of Christmas from Dec 11-22, I have shown you some of them on previous days. This one I made using My Digital Studio. I did not have to look for cardstock or ink or stamp sets just MDS. It was a lot of fun. I will use this to send a note to my customers and downline in the month of Jan. I love the way it turned out. If you want a one on one training for MDS just send me an email and we can set it up. 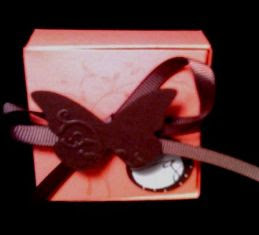 I will have it available at my SAB workshop Dec 29- be sure to look at it while you are here stamping and having fun. Yesterday I had a team meeting and included was a cookie swap (we had so much fun with this. 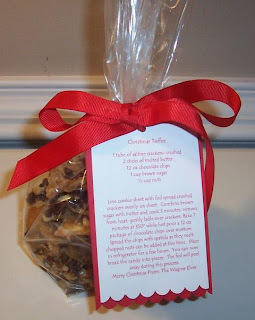 Here are some pictures of our cookie swap! Find great deals on Big Shot Dies and select Big Shot supplies –Great Christmas gifts! Be sure to order by December 15 to insure delivery by Christmas. Visit my Online Store to find great deals today. Click Here to view pictures of each item! Stamp Club DEC 12 10:00 AM - 12:00 PM (Eastern ) Sat morning- Stamp Club will be meeting my house- free for stamp club members, visitors are welcome, you can come one time as a guest and just pay a $10 fee and see if you like it. We will be working on thinking of you cards and Gloria is our hostess. Check us out you may want to join us each month to make cards and/or 3-d items. All you have to do is to purchase $25. each month and you will take turns to be hostess and get all the free hostess benefits. Send me an email or call me if you are interested in joining our club. Wagstampers Team Meeting DEC 13 2:00 PM - 4:00 PM (Eastern ) Sun- Wagstampers Downline team meeting -2pm we will be making samples with our new Occassions and SAB sets we have preordered to have them ready to show you at our upcoming classes and club and stamp camps. Join my team and you can come too. No FEE. We are also sharing in a cookie swap. If you are interested in joining my team and the fun send me an email or give me a call. 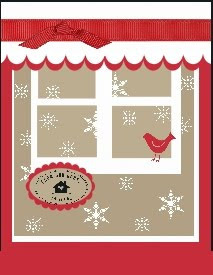 Cute Box / cards Class DEC 15 7:00 PM - 9:00 PM (Eastern ) Tues- Cute Box / cards Class with 4 all occasion cards (great last min gift) 7pm Class Fee $20 Email me to reserve your spot or give me a call. SAB Party DEC 29 7:00 PM - 9:00 PM (Eastern ) Tues- First SAB workshop/party. 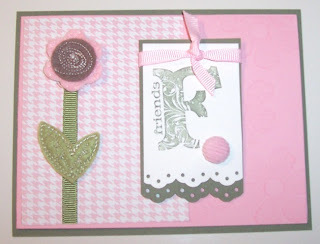 No Fee, be the first on your block to play with the newest fun products Stampin UP has to offer. I can not order before Jan 5th but with the holidays and my trip to Phoenix for Leadership conference, I needed to get the annual SAB promotion going. Remember you can choose from the free (sale a bration) sets for every $50 you purchase. I am excited about this years offerings. Plus I will have both the SAB and the spring Occasions mini. There are so many cute things you will not want to miss it. You will also want to have your own party so you can earn more free products. I have ordered mini catalogs for those that have ordered from me and you should get themat the end of Dec. I have also ordered extra copies so I can give them out at workshops and classes etc. RSVP today so I can prepare for you. 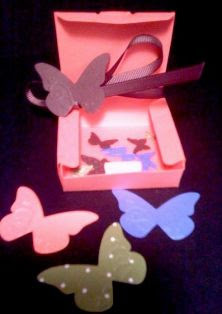 I made this little box of butterflies for Gloria who is helping me with my Monday morning stamp club tomorrow. I used the Bitty Box and Envelope Die from our Big Shot collection as well as Beautiful Wings Embosslits from the new occasions mini catalog. The colors are cameo coral and chocolate chip and whisper white. I hope she likes it. I will be teaching a class with this in January so stay tuned for more classes. 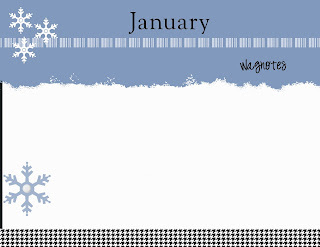 Contact me today to get on my calendar for January SAB parties. 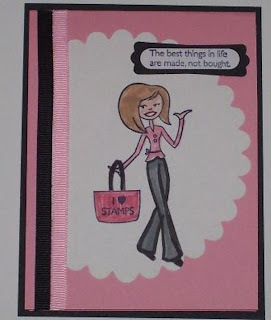 I promise you are going to love the new mini SAB and Occasions catalogs.